Do you have this retrospective moments when you think about an event in the past, the decisions that have been made and what the consequences of them were? The circumstances of how the cinematographic duo Bud Spencer and Terence Hill was born, is one of those moments that changed my quite well going career as an actor at that time dramatically and is memory I always like to remember. In contrary to everyone's expectations, luck sometimes is not that far away to be found, but just around the corner. That was also my case. 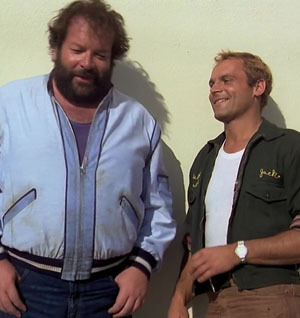 Carlo Pedersoli (Bud Spencer) and I used to be members of the same swimming club in Rome / Italy when I was a teenager. I was an admirer of him because as a swimmer he had already broken italian records and participated at the Olympic games. Sometimes I pursued his training sessions at the border of the swimming pool. But we did not know us personally and never had a conversation at that time. 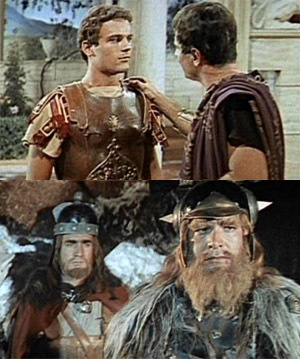 After some successful years as an actor, in 1959 I was chosen to be part of the movie “Hannibal” directed by Carlo Ludovico Bragaglia playing the role of “Quintilius”. Carlo was casted to play the part of a soldier in the same movie. We were playing in the same movie, but we still didn’t know each other. Our shootings were done in separate days. But our time had still to come, eight more years had to pass until our career would change dramatically. During this eight years Carlo worked as composer and songwriter and later in a movie production company. I continued the already well going career as an actor and had the opportunity to play roles in great movies with famous actors. For example in “The Wonders of Aladdin” with Vittorio de Sica or “The Leopard” with Burt Lancaster and Claudia Cardinale and later the Karl May saga of “Winnetou”. In 1967 I was hired by the director Giuseppe Colizzi shortly before the start of the shooting of “God Forgives, I Don't (Dio perdona... io no)”. The co-star actor had an accident and broke his foot shortly before the start of the shooting and I was as hired as his replacement. In this movie I played the role of “Cat Stevens”. Because I was hired as a last minute replacement, I had to quickly pack my stuff and fly from Italy to Almeria / Spain, the location where the movie was shot. Carlo played the role of “Earp Hutch” in the same movie, we met the first time on the set in Spain. Pretty funny considering that our paths had crossed so many times in Italy until that day. In our first encounter we had a very formal chat - “Hello, I’m Mario.. I play the role of Cat.. Hi I’m Carlo.”. Do you remember, at the beginning of this story when I was talking about going back and evaluating events in the retrospective? This was one of those unbelievable lucky moments. Neither one of us could ever imagine that this was the beginning of a new wonderful chapter of our lives. A chapter made of overwhelming professional success and the beginning of a sincere personal friendship. Both Carlo and I were asked in this occasion to use american artist names to improve the international appeal of the movie - at that time american names would bring more people to the theatres. Carlo decided to call himself “Bud Spencer” from that day on when acting and I chose “Terence Hill”. Bud and I had an instant positive vibe between us when acting in front of the camera. Everything felt so easy and things that usually have be done over and over again, resulted just intuitively. These synergies between us were immediately noticed by Giuseppe Colizzi. He understood immediately that our type of characters complimented each other perfectly and that there was lots of potential. Colizzi hired us to play in two more films, in 1968 “I quattro dell'Ave Maria (Ace high)” and in 1969 “La collina degli stivali (Boot Hill)”. The three films gave both Bud and me a huge career boost. We received lots of offers for new projects, and the best had still to come. Enzo Barboni (E. B. Clucher), a renown director of photography of many important films had the intuition to create a new type of “Italian Western” with more humor and gags and less killing. For “Lo chiamavano Trinità... (My Name Is Trinity)” he had collected numerous refusals from producers: “the concept does not work, there is too much dialogue and not enough action, the audience wants to see shootings and killings” - these were the kind of reactions he had been told over and over again. But he knew what he was doing and was determined to stick to his ideas and then, when he finally showed the script to Italo Zingarelli, Italo was excited from the first moment and decided to produce the film. They offered the main characters, “Trinity” and “Bambino”, to Bud and myself and the roles felt like someone had tailored them to us. With E. B. Clucher on the set, we had a lot of fun, Enzo accepted a lot of our ideas to improve the daily shooting. The movie was shot in a fantastic valley between the mountains in the center of Italy and even though the budget was pretty small we were really motivated to do a good job. Between the shooting we had lots of fun. We had a great time, everything was just right and the story would not be complete without mentioning our great team of stuntmen guided by a fantastic stunt coordinator, Giorgio Ubaldi. The film hit the big screen in 1970 and was an unexpected huge national and international success becoming the highest grossing Italian film worldwide, beating all previous records. The success was so big that cinemas had a lot of problems to contain the enthusiasm of the audience with many people who remained seated after the show and wanted to see the movie again and again. After the first Trinity movie, we did “Blacky the pirate” and then the sequel of Trinity, “...continuavano a chiamarlo Trinità (Trinity Is Still My Name)” that topped the success of the first one and made us international movie stars. In 1972 we traveled to Colombia to interpret two airplane pilots in “... Più forte ragazzi! (All the Way Boys!)”. 1974 was an extremely productive year, besides “The two Missionaries”, a fan favorite movie was shot in Madrid / Spain: “Watch out - we’re mad”. In the meantime Bud and I had the opportunity to dedicate each for himself to other projects. Among others, Bud did in 1973 the first film of the “Flattfoot”-series as Commissioner Rizzo in “Piedone lo sbirro (Flatfoot)” directed by Steno. I had the wonderful opportunity to play the role of “Nobody” in “My name is Nobody”directed by Tonino Valerii and Sergio Leone with Henry Fonda as the outlaw “Jack Beauregard”. We both proved we could be very successful on our own. In 1977 we were offered another fantastic script from E.B.Clucher and we did our first movie in Miami / Florida as two improvised cops. “Crime Busters (I due superpiedi quasi piatti)” was another incredible international success. Followed in 1978 by “Odds and Evens (Pari e dispari)” again produced in Miami / Florida. The last movie in the 1970’s was “I'm For the Hippopotamus (Io sto con gli ippopotami)” directed by Italo Zingarelli and shot in South Africa. 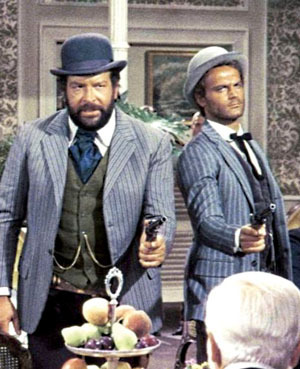 By the end of the 1970’s the duo Bud Spencer and Terence Hill had become famous all over the world. From Europe to North and South America, Australia and South Africa, we received attention and fan letters from everywhere. In that time not only our popularity had become huge, but also the friendship between Bud and me. The 80’s started like the 70’s had ended: With “Who Finds a Friend, Finds A Treasure (Chi trova un amico, trova un tesoro)” and “Go For It (Nati con la camicia)” we added two more successful films to our portfolio. An absolute premiere came out in 1984, in “Double Trouble (Non c'è due senza quattro)” the duo becomes a quartet: Both of us, Bud and I play two roles in a story ambientet in Brazil, the story of "Sebastiano Coimbra de la Coronilla y Azevedo" and "Antonio Coimbra de la Coronilla y Azevedo" and their look alikes “Elliot Vance” and “Greg Wonder”. “The Miami Cops (Miami Supercops)” in 1985 was the end of an era. 16 years after our first appearance together on the screen we decided that the time had come to move on and to dedicate ourselves to other projects. Against all expectations, in 1994 we decided to come back together again for the movie “The Troublemakers (Botte di natale)”. This time it was a family thing, Bud’s son Giuseppe was one of the producers while my son Jess wrote the screenplay and had a small role as telegraphist. For me personally stories and facts around the duo “Bud Spencer and Terence Hill” still surprise me today. It’s incredible how much love and affection we receive. In messages from fans it is interesting to learn that each one has its favorite among the 17 movies that Bud and I have made together. Each person has its own story to tell, why and how a certain movie has become a favorite. Among lots of stories, there are those of families that like a ritual come together to watch our movies together in front of the tv, persons who retrieve personal inspiration and motivation to solve matters of their life, fathers who introduce their children to Bud & Terence movies, or just the fans who say "thank you" for the wonderful entertainment we gave them. Realizing that we are not only “entertainers” on the screen but as well part of so many families is something the touches me very much. I would like to thank all fans out there for all the support over all these years.